Come along on a tour of the wonderful world of birds and their beaks. This book is the story of a child and two grown-up friends on a jaunt across their yard, in a park, past a pond, and through the pages of a photo album. Like them, you’ll find you can figure out what birds eat by the shape of their bills—and why some have beaks like straws, pouches, or even daggers. Also like them, you’ll have all kinds of questions about amazing birds—from house finches to hummingbirds to great blue herons—that use their own built-in tools for eating. Rounding out the story are five kid-friendly activities and background information parents and teachers can use. The authors are the husband-and-wife naturalists who also wrote and illustrated the NSTA Kids book From Flower to Fruit. 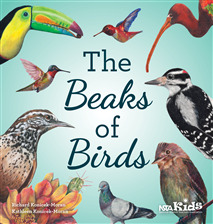 Just as that book was designed to encourage budding botanists, The Beaks of Birds will provide a fascinating start for future birders and biologists.